Before the demolition. 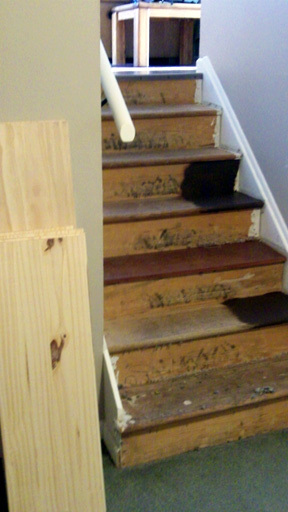 Lots of mismatched stairs, one broken (third from the bottom) that came up with the carpet, and non-square walls. After demolition. the challenge of re-leveling the stairs took a lot more time than it really should have. We went out the front door and in the garage door for many, many hours. Newly finished stairs! They are sturdy and beautiful, and we will eventually paint them – but, for now, I’m just totally stoked not to have to skip over a step or two when descending.